Chiang Rai, Thailand's northernmost Province, is characterized by rugged terrain and stunning scenery. To the North lies Myanmar, and to the East, across the Mekong River, Laos. Like neighboring Chiang Mai, Chiang Rai was founded in the 13th century AD by King Mangrai. Today Chiang Rai offers the visitor an experience of rural Thai and hilltribe life. Travelling the mountain roads of the province, one really feels far away from everything. The border with Myanmar is bustling with trade, and day trips to that country to witness the markets and life of the people are easily arranged. In the East of the Province, the town of Chiang Saen, formerly a royal city. The most northern Thai town, Mae Sai bustles with the excitement of cross-border trade. All day people come and go across the bridge to Myanmar, peddling their wares, which range from cheap duty free imports, through all manner of exotic herbs and roots from the forest, to precious stones and antiques. Temples perched on a hill above the town provide excellent views across this busy market and into neighboring Myanmar. A short journey to the south of town are several extensive caves. This is the point where Thailand, Myanmar and Laos meet at the confluence of the Ruak and Mekong Rivers. It is possible to take a long tail boat ride up the Mekong, and close to the Lao side, where vendors sell Lao beer from their floating bars. The town has an active market during the day, and also hosts the House of Opium, a museum detailing the opium trade which made the area famous. 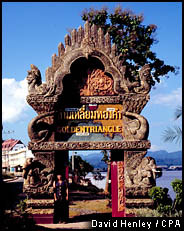 The Kingdom of Chiang Saen came into being in the 14th century as a principality of Lanna, ruled by a nephew of King Mangrai. It didn't come under Siamese governance until the end of the 19th century. Today the busy trading town is littered with ruins bearing testament to its former greatness. Some of these ruins actually predate the Chiang Saen Kingdom by a few hundred years. Chiang Rai has the highest concentration of ethnic minorities in the country, and it is not unusual to see tribal people going about their business whilst travelling through the province. 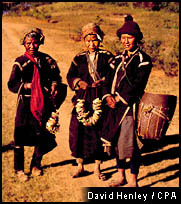 Indeed, many of the mountain roads have become focal points for the tribes, where by day they set up markets. If you are interested in visiting hill tribe villages, then Chiang Rai is a great place to do this. One interesting way to reach Chiang Rai is by long tail boat down the river from Tha Ton in neighboring Chiang Mai province. The journey generally takes about half a day, though there are several riverside villages one can stop at along the way to prolong the journey. The river passes through pristine forest scenery along the way, and if you are lucky you may catch a glimpse of some of the native wildlife.